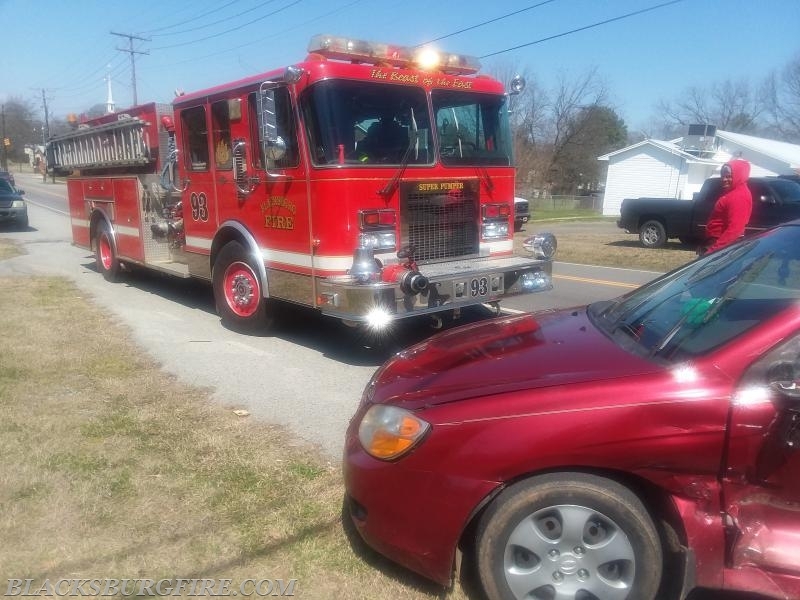 Motor Vehicle Accident at W. Lime St. And S. Charleston St.
On March 15th Blacksburg fire department responded to the above intersection referencing a two car motor vehicle accident. On arrival a truck and a compact sedan were noted at the scene. The front end of the truck sustained moderate damage while the driver's side of the sedan sustained major damage. Thankfully all occupants and people involved were not seriously hurt. Be sure to acknowledge stop signs and all other traffic control devices on the roadways. Only proceed if you know you have enough time before oncoming traffic reaches you. Remember the 3 second rule of stop signs. After coming to a complete shop, count slowly to "3" and look left, right, and left again. When clear, proceed.